One of the original air-core tunable AM antennas. You just put this near the radio and peak it for reception. I was watching for one of these in good shape, and not overpriced, and they have been in and out of production over the years. This one is from a later production run as can be seen by the extended AM range (1700). Jay Allen reviewed the S.A.T by comparing the the TERK Air Core antenna not long ago here: https://radiojayallen.com/select-a-tenna-vs-terk-am-advantage/ The TERK reviewed well, and looks more modern, but I wanted the classic cheesy art-deco looking S.A.T. I won't post a long, boring review here. Many have already reviewed this radio. All I can say is that if you like small, decent-sounding transistor radios, you will not be disappointed. If you are expecting top-shelf performance, and perfect ergonomics, then you you may not be happy, but for around $19 you really should be happy with this little gem. A great little radio at a great price and the most impressive thing here is the sound. 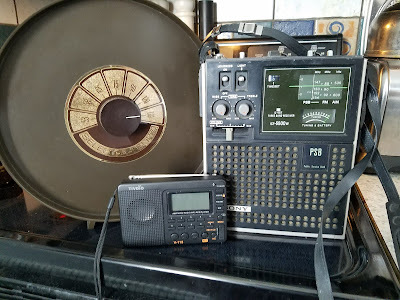 The radio has a small passive radiator like the Meloson M8, and M7, and really surprises me. It can also be used as an amplified speaker, and has a micro SD slot for using it as a standalone MP3 player. Grab one! Most transistor radio collectors know this radio. It's a classic for sure, but I have to give a little background on why I wanted one. When I was about 12 years old, I had a few analog SW portables, but nothing with direct frequency readout. Panasonic had introduced it's series of direct-readout radios, the RF-2200, 2800, and 4800, and Sony was competing with the ICF-5900W. 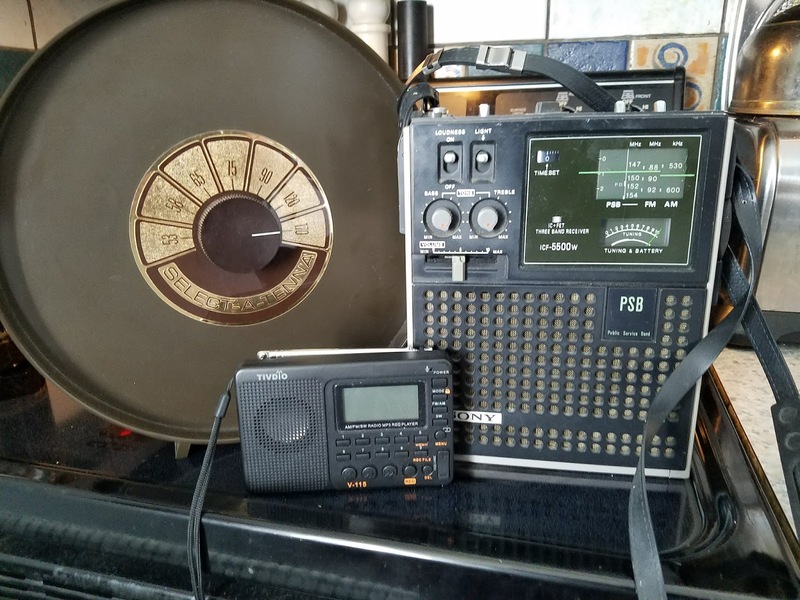 Dad acknowledged the quality and technology of these radios, and told me that if I saved most of the money by working for him, he may help me get one. The 2800, and 4800 were way out of reach, but one Sunday in the local paper, a department store in Kingston (Britt's, which was Newberry's answer to Macy's) had the 2200 advertised for $138.88. I had been flip-flopping between the Sony and the Panasonic for weeks, but that was the clincher. The radio is still in use. My sister in law has it. I had given it to my late brother Paul at some point and she still uses it as her main radio. Why this Sony though? I still want a 5900W. When I saw this one come up at an auction, I recognized the shape it was in. The ICF-5500W was the companion radio to the 5900W. AM/FM and VHF Hi (with a basic, but functional squelch control). The 5500 and 5900 are a monument to Sony design at the time. The pop-up antenna (which still works flawlessly), The separate Bass, Treble, and Loudness controls, The overall quality of sound and function, all of this is an example of what Sony was producing at the time. I think their modern small electronics are a shadow of what they were capable of years ago. This thing still sounds great and performs well next to my modern DSP radios. I still would love to get a pristine 5900W but they usually fetch premium dollars. Maybe someday. Bravo Sony, but where did you go?